Canadian captain Dillon Dube couldn't believe what he was hearing. Swiss head coach Christian Wohlwend was virtually raising the white flag of surrender, saying Switzerland expects to be dominated by Canada in Tuesday's quarter-final at the world junior hockey championship. 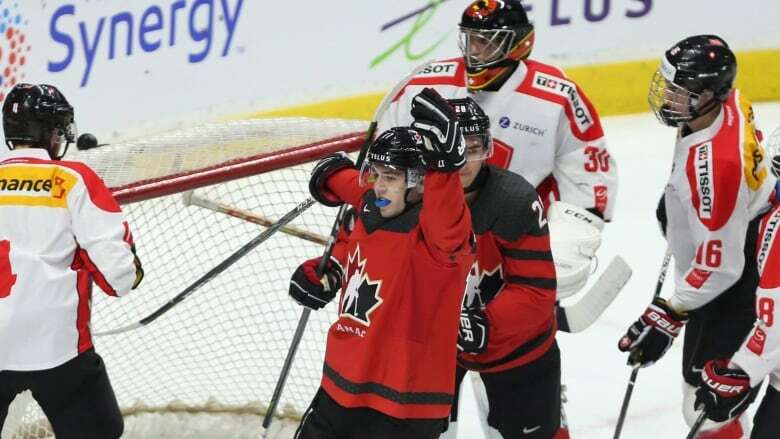 "They're faster, they're bigger, they're stronger, they can shoot better, they can pass better, they can do everything better," Wohlwend said Sunday after his team dropped a 6-3 decision to the Czech Republic to set up the Canada matchup. "They have how many first rounders? And the rest in the second round? And one in the fourth round that has played the most NHL games? "We have one in the fourth round too. One. The rest are undrafted." Wohlwend did make some good points. Canada has eight players who were drafted in the first round and the rest were taken in the second round or later. Defenceman Victor Mete, a fourth-round pick in 2016, played 27 games for the Montreal Canadiens this season before being loaned to Hockey Canada for the tournament. Also, Canada beat Switzerland 8-1 on Dec. 22 in a pre-tournament exhibition game. However, Dube was still stunned to hear Wohlwend's frank assessment of Switzerland's chances. "I didn't know what to think of it at the start," said Dube, who had two goals and an assist against the Swiss in the exhibition. "I watched it a couple of times, laughing a little bit. To be honest, I think everybody did. "I think that might have been some reverse psychology or something like that." Sam Steel, Dube's linemate throughout the tournament, agreed that Wohlwend might be trying to lull the Canadians into a false sense of security. "I don't know if he's trying to play mind games or something," said Steel, who led Canada with five points in the preliminary round. "It's funny, but we have to go in there with the same attitude we would with any other team." Canada took New Year's Eve off, opting for a team dinner with Hockey Canada staff and players' families. Head coach Dominique Ducharme had his team back on the ice Monday to prepare for the Swiss. Mete was the only player to sit out the practice session. Ducharme said the blue-liner was hurt in Friday's 4-3 shootout loss to the United States. "He's good, we just want him 100 per cent and we felt he needed an extra day," said Ducharme. "He's going to be in tomorrow." Goaltender Carter Hart will start in net for Canada against Switzerland. Hart has two wins and a shootout loss with a .929 save percentage and 1.95 goals-against average. He's coming off an 18-save shutout in Canada's 8-0 rout of Denmark on Saturday that clinched top spot in Group A.
Dube, Steel and Ducharme were all in agreement that despite Wohlwend's comments they would not take Switzerland lightly. "I think he's obviously trying to send a message to his team, he must have said something to them," said Dube. "I think that's why he said that we dominated them in the exhibition. They're going to come out trying to catch us sleeping so that's why we really have to focus on our game and know what to expect, they're going to come out hard. "That doesn't mean they're going to sit back and let us roll all over them." Has parity finally caught up to Canadians at world juniors?